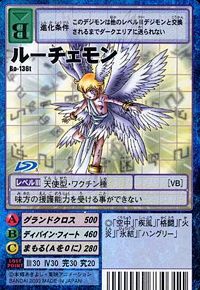 Said to have descended to the ancient Digital World long ago, it is an Angel Digimon which has the appearance of a child. It manifested in an era in which the Digital World was still chaotic, and it is said that it brought about order and harmony. 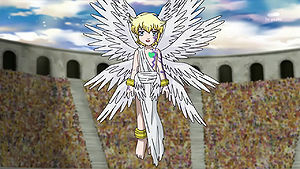 However, a long period of darkness was summoned due to Lucemon's later "Rebellion". Although it has the appearance of a child, the power and intelligence it possesses surpass even that of a Perfect Digimon. 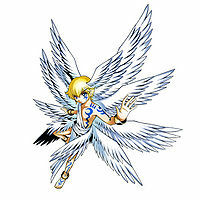 It is said that Lucemon's abilities have now been inherited and split among the Three Great Angels. Its Special Move is firing ten super-heated spheres of light arranged in a cruciform syzygy (Grand Cross). 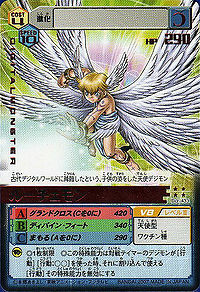 This technique possesses a power surpassing that of Seraphimon's "Seven Heavens". n., Luce 「ルーチェ Rūche」 means "light", and is a reference to Lucifer (Lat: "light-bringer"), a royal title that is commonly considered Satan's name before his rebellion. Anime/Manga Digimon Frontier: "Bullying is Unforgivable! Evolve, Chakmon of Ice"
Grand Cross [N 2] グランドクロス Gurando Kurosu Cross Strike/Galaxy Crash/Grand Cross Fires ten superheated orbs in a cruciform syzygy. Divine Feat  ディバイン・フィート Dibain Fīto Divine Feet Fires a beam of holy energy. 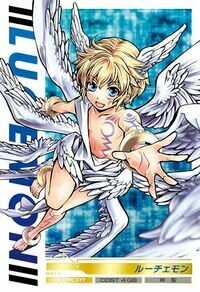 Lucemon was a Digimon who caused the beast and human type Digimon to stop warring with one another and brought peace to the Digital World. He then tried to use some of his angelic powers. Unfortunately he became corrupted. 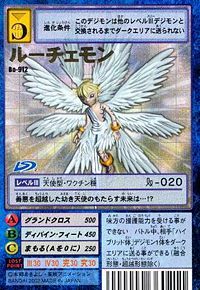 In this dark state, Lucemon tried to order all Digimon to obey him. The Warrior Ten fought him and sealed him into the Dark Area. Kaiser Greymon and Magna Garurumon stopped Lucemon, but they were violently defeated by Lucemon Falldown Mode (a result of Lucemon absorbing the data of the Royal Knights Dynasmon and Lord Knightmon). 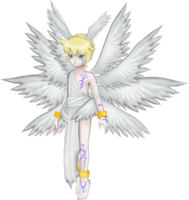 Lucemon is a resident of Heaven Zone and along with the tyrannical Slash Angemon, is vying to become the leader of the zone. He is extremely knowledgeable, spending much of his time in the library and wants to rule with love and peace rather than his opponent's swift use of execution for offenses as minor as walking on grass without permission. However, it is revealed that he is actually a servant of Lilithmon (and by extension Bagramon) and is a member of the Bagra Army. He makes a deal with Amano Nene to let her have the contents of the Temple of Darkness (as per Dark Knightmon's wishes) that is hidden within the zone in exchange for assistance gaining the Code Crown. 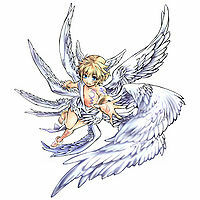 Lucemon is a Champion-level Mercenary Digimon which can evolve to Lucemon Falldown Mode at Lv 41. 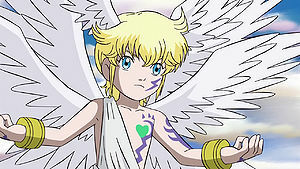 Lucemon appears in the Scheme of the Demon Lords chapter (策謀の魔王篇 Sakubō no Maō-hen). 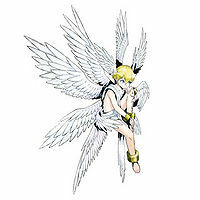 It is also an obtainable Digimon which is evolved from Tokomon, and can evolve to Angemon or Devimon. It can also be obtained as a collectible card. Its card is part of the The Strongest and Wickedest Demon Lords (最強最悪の魔王 Saikyō Saiaku no Maō) set. 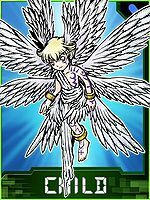 To obtain Lucemon, after previously having an Ultimate with a Master Status, train both Puttimon and Cupimon in the morning with no care mistakes. It cannot evolve, but its stats are second only to Omegamon (Pendulum Progress 3.0), and has the longest life expectancy of 190 hours. 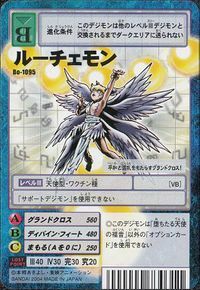 Lucemon is a Leader digimon available from a DigiMelody. 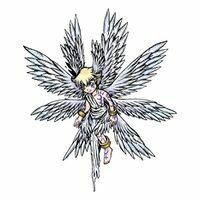 Born with 12 wings, the perfect Angel Digimon's descent! 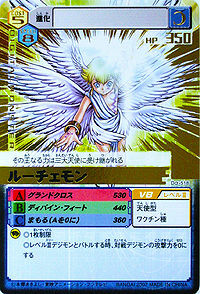 Just what kind of future will the child angel who transcended good and evil bring...!? Its Grand Cross brings peace and chaos! 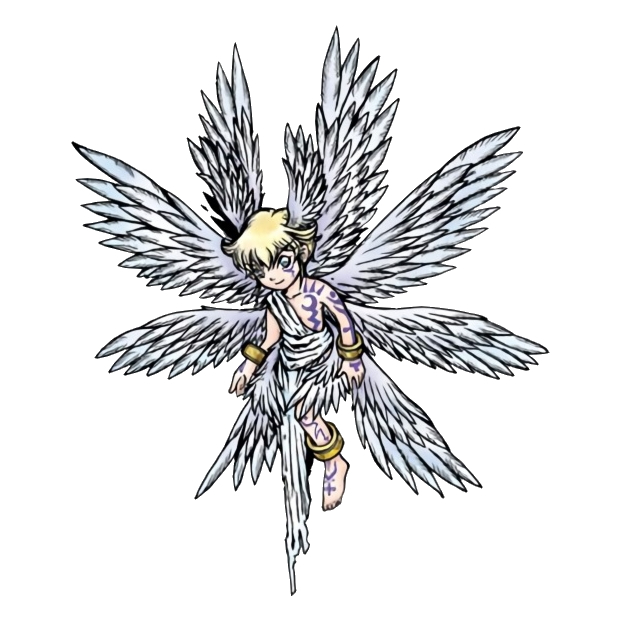 A rebellious angel who brings hope and darkness to the world! 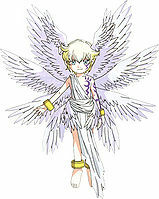 An Angel Digimon who takes on the form of a child, it was said to have descended upon the ancient Digital World. Its ruling power was passed down to the Three Great Angels. 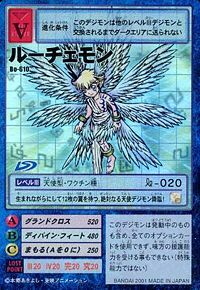 A great Angel Digimon that stopped the war and brought peace to the ancient Digital World. 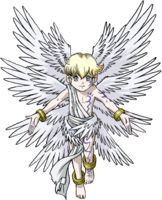 Its abilities, which surpass even that of Perfect levels, were inherited by the Three Great Angels. 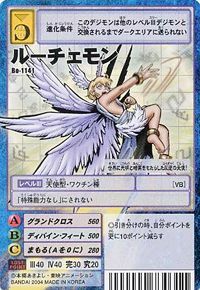 ↑ Digimon Frontier, corrected to "Lucemon" in later episodes. ↑ In astrology, a Grand Cross is said to occur when four planets are all separated from each other by Square aspects (90 degrees apart). This page was last modified on 4 April 2019, at 08:43.